Japanese hornwort also known as Ito-mitsuba or Aomitsuba in Japanese is a variety of parsley grown in Japan. 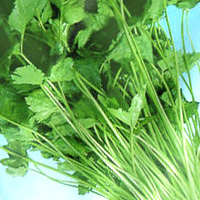 Among parsley crop, it is said to be the most commonly sold as well as having the strongest smell suitable for cooking. The calories in Japanese Hornwort per 92g(1bundle) is 12 calories. Japanese Hornwort is calculated to be 13Cal per 100 grams making 80Cal equivalent to 615.38g with 2.67g of mostly carbohydrates、0.83g of protein、0.09g of fat in 92g while being rich in vitamins and minerals such as Vitamin K and Vitamin A Retinol Equivalent.